Andy Diggle is taking his gun from John’s safe when John walks in. Andy explains that Malcolm Merlyn has spoken to him and wants him to steal some missiles that the Army are going to be transporting. Oliver explains to the team that he saw the idol on Lian Yu a long time ago (not enough for the flashbacks to be relevant yet though) and that he is worried about Andy, although John says Andy is fine. After Ruve Adams’ Mayoral acceptance speech, where over 40% of the electorate had written Oliver Queen’s name on their ballots, Adams tells Laurel that the District Attorney is now going to become the Deputy Mayor and so Laurel won’t have time for the Damien Darhk trial as she is being offered the District Attorney’s position. Green Arrow and Spartan wait for the Army truck whilst Thea and Laurel stay back in the ArrowCave. Malcolm bursts in with some of his old League of Assassins men and fighting starts. 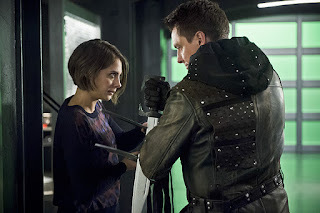 When the chance comes for Thea to kill her father she hesitates which allows Malcolm to escape with the idol. The robbery on the convoy starts but is stopped very quickly by Spartan, Andy and Green Arrow. Andy remarks that it was easy and Green Arrow is suspicious as it was too easy. Laurel talks to her father, the suspended Captain Lance, and he asks her not to take the D.A’s job as he is really proud of all she has become including being the Black Canary. TeamArrow follow Andy to a warehouse where he has told them Malcolm is hiding but it is an ambush and Andy is wounded by an arrow. Merlyn meanwhile is in Iron Heights prison giving the idol to Damien Darhk in exchange for Thea and his life being spared when Darhk unleashes his diabolical plan to destroy the city. Darhk is not happy though as a gemstone that makes the idol work is missing. Whilst stitching Andy’s wound John tells his brother that they have hidden the stone so Darhk will never get the idol’s power. Oliver isn’t happy with John sharing the information and Laurel is at the prison having all the cells searched looking for the idol. Darhk gets quite threatening and teases her about easy it would be to end her father’s life. Back at John’s flat Green Arrow finds Andy searching the place. Andy states he was looking for surveillance bugs but Green Arrow accuses him of being a traitor and looking for the stone. John bursts in and threatens Green Arrow with a gun. Back at the ArrowCave Oliver tries to explain to John why Andy can’t be trusted but John defends his brother, blames Oliver and rubs salt in the Felicity wound. Laurel tells Oliver that she is going to turn down the DA job as she likes being the Black Canary and helping the team. Oliver tells her the team is falling apart and she should take the job as, sometimes, a city needs a hero without the mask. Darhk, along with the silent help of Murmur, have planned a prison siege. Murmur has been handing out books with weapons hidden inside of them and they attack the guards and take hostages. The team need a way in so Quentin, who isn’t allowed onto the scene due to his suspension, punches Lieutenant Lopez allowing TeamArrow to get past the police and into Iron Heights. Spartan has brought Andy with him and they start to fight the prisoners. Malcolm has sneaked in and fights Speedy but when he has her defeated he mocks her instead of killing her. Darhk threatens to shoot Andy unless the team lower their weapons, which they do, and then Andy proves he was a traitor all along and gives Darhk the stone. Darhk gets wounded so Andy kills two people as a sacrifice and Darhk uses the blood and the idol to garner its power and resurrect himself. He knows who all the team are and then stabs Laurel with an Arrow. Green Arrow runs to a hospital carrying Laurel who is immediately taken into surgery by the doctor. Quentin tries to get himself released from police custody when he hears the news but the doctor says that surgery went well and Laurel should recover. Everyone goes to her bedside, including Felicity, and after they leave to let have some rest she asks Oliver for a favour and whispers to him. A moment later the crash team are in the room as Laurel has taken a turn for the worse. The doctor calls time of death at Eleven-Fifty-Nine. There was a lot to like tonight. The Andy Diggle story finally got some proper attention and, whilst his duplicitous behaviour was obvious, it played out well. Neil McDonough just oozes evil as Damien Darhk and is most definitely my favourite baddie now and, due to his escape and actions in killing Laurel, I’m guessing we will see a lot more of him in the near future. And then we find out who was in ‘that’ grave, the season long mystery that has ended with the death of Laurel Lance/Black Canary. I know just recently that the death of cast members hasn’t meant a lot on Arrow, as they always seem to find away to bring them back, but the finale of this episode had an air of finality about it and along with some haunting music from Blake Neely I found I actually had a tear forming in the corner of my eye. It has taken 3 ½ seasons for me to warm to Katie Cassidy, I don’t know why but I always found her highly irritating, but her demise stoked up genuine emotion in me so kudos to Cassidy and the writers for managing to do something I didn’t think possible in superhero television shows. Sad, sad, but enthralling episode.